Few months back we released Presentation mode in our Power BI Mobile app for Windows devices, which better allows you to focus on your data during meetings. 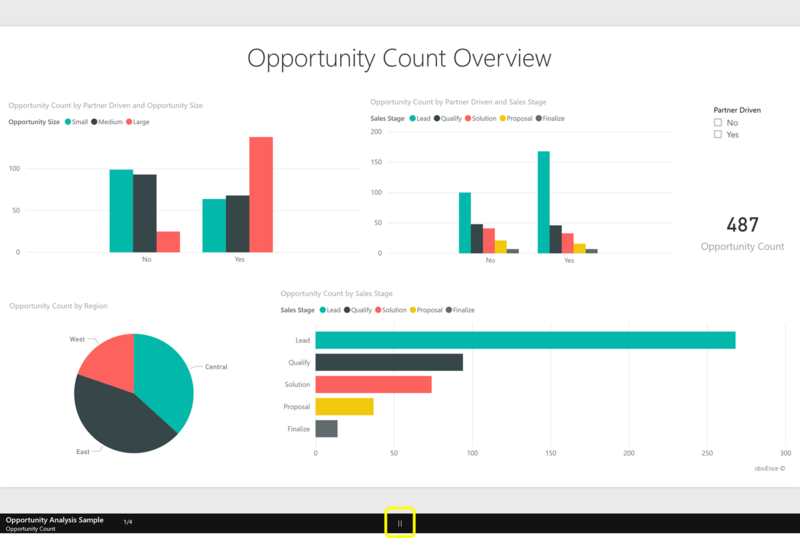 Using Power BI Windows app with presentation mode enables you to present, collaborate, and have productive discussions while using your data in your Power BI dashboards and reports. You can use presentation mode on any device running Windows, like Microsoft Surface Hub, your Windows desktop or tablet. We received great feedback from you with regards to presentation mode, and now, in this release we added slideshow feature to it. Slideshow is great for presenting data in public displays, like office public spaces and factory control rooms, where everybody needs to have a quick view of business or operational metrics. While slideshow is running you’ll see, in the footer, which page is currently presented and how many pages there are in the report. Check our What’s new page with all Power BI Mobile apps updates. Get Power BI app for Windows from the store.